Some years back prior to moving to Ethiopia a family friend gave me a beautiful painting from Ethiopia with 3 chocolate coloured, almond-eyed women sitting around and making coffee. 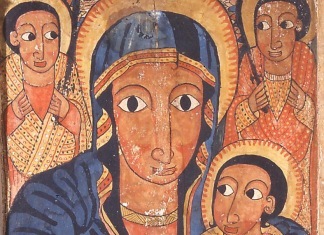 Their distinctive faces are typical of drawings and paintings that date back centuries in the Ethiopian Orthodox church. Although I do not frequent many churches, I did notice something rather odd, outside all major churches in Addis there are men or women selling large posters of a blue-eyed, blond-haired Mary holding a milk-coloured baby Jesus. I was caught a bit off-guard. I then took a trip to Lalibella, which I blogged about last year. There among the 11 rock-hewn churches that we traversed, I saw only 2 main pictures depicting biblical figures as seen in the Ethiopian Orthodox Church. Instead around each and every altar there was this new image, a foreign image. I couldn’t really understand the significance or implications on the religion. Last week I attended a lecture where this very same issue was brought up. From a religious point of view, I can’t even begin to delve into the matter because I know far too little. As an art from it is sad that such iconic images are disappearing from the view. I get the sense that some view this style of art as archaic vestiges of the Orthodox Church. Although the church popularized this artistic style, it is not only limited to the church but represents a style that has been crafted, and refined in Ethiopia. Again with so many matters that compel me to write a blog post, I have more questions than answers. It is understandable in this increasingly interconnected world that with many things including art, food, music there is a global sampling process taking place, but how is this process taking shape? why are some things so easily adopted and why are we so quick to let go of what we have? Observing this shift in Ethiopian art, made me reflect on the fact that in Sudan we widely celebrate international artists, and at regional scale many Middle Eastern artists but are not so generous to our own home-grown talent. In terms of music there is wide appreciation but when it comes to visual arts, there is relatively little support or praise. I ask my Ethiopian friends to shed some light on this issue with respect to the disappearance of black Jesus from church mantles across the country. As for fam and friends out there, we need to do a better job of promoting and supporting our local artists, because it is a shame that their unique and inspiring work is going about unnoticed and being overwhelmed by works in the international sphere.